Places to see in Shankarda, Jharkhand: There is something about Paharbhanga Hills and Rankini Mandir just 07 kilometers away. Here two rivers meandering through tribal villages meet the Subarnarekha River on a remote valley. It is a sight to behold! The villages are lined with mud houses decked with colourful paintings on their walls. The rich culture of some of the oldest tribes of India still survives in these villages. Nearby attractions of Shankarda: Just 52 kms from Shankarda is the Chandil Dam built at the confluence of Subarnarekha and Karkori Rivers. 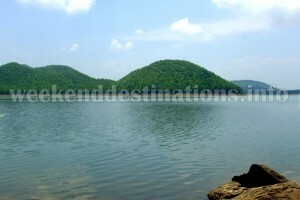 The dam and its adjacent lake surrounded by dense forests and hills is one of the most scenic spots in Jharkhand. A museum and some temples border the lake. On the way to Chandil, you can cover the Dimna Lake (32 kms from Shankarda) and Jubilee Park (24 kms from Shankarda). If you are planning to stay a couple of days at Shankarda, then you can keep a visit to Dalma Hills just 32 kms away in your itinerary too. The forests surrounding the Dalma Hills are famous for wild elephants and you can catch a glimpse of them if you are lucky enough. Few other popular destinations like Ghatshila and Galudih also fall within 40 kms of Shankarda. Things to do at Shankarda, Jharkhand: Take a walk in the nearby villages and capture the daily life of the villagers, arrange a picnic in Paharbhanga Hills or enjoy a cockfight in the local market. If bird watching and hiking is your new-found love, then the hills and forests around Narwa can be very rewarding. If photography is something you have always cherished, then you can get some of the best glimpses of tribal life in and around Shankarda. 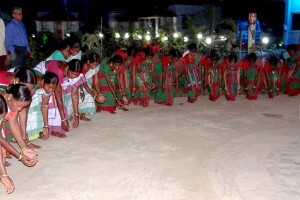 The resort also arranges for local tribal programs in the evenings on request. 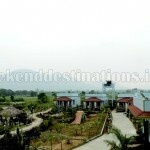 You can try fishing in the resort’s pond or rent a bicycle and paddle your way through the paddy fields and villages. It must have been long since you felt the wind on your face! Best time to visit Shankarda: The dark clouds roll down the Narwa hills and green paddy fields during monsoons and it makes for a sight to behold. The winters bring in a chill and you would enjoy the mid-day sun, wild flowers and the many tribal festivals. Shankarda can be visited anytime of the year and especially when you are stressed out. How to reach Shankarda, Jharkhand: There are regular train services to Tatanagar from all parts of the country. Shankarda is 15 kms from Tatanagar Railway Station. Pickup service from Tatanagar Railway Station or Jamshedpur is also available. Accommodation and food at Shankarda: Managed by ex-servicemen, the eco resort in Shankarda is a piece of dream for anyone. 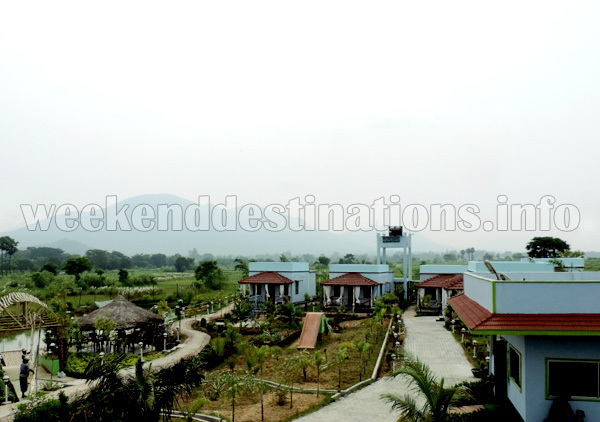 There are Five Double Bed cottages and One 15-bedded dormitory facing the Narwa Hills in the distance. 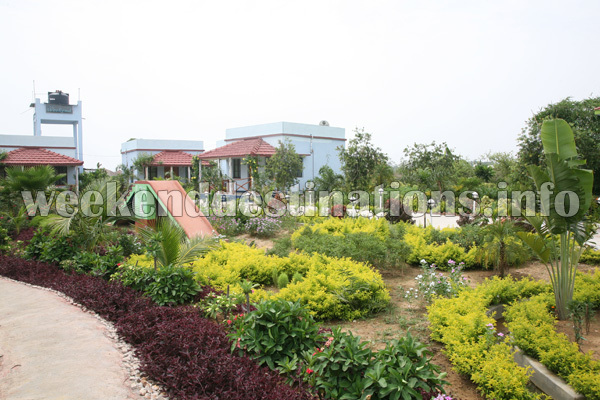 The eco resort is decked by vegetable gardens, sprawling lawns and flower beds on all sides. The cottages are equipped with all modern amenities like 24-hours electricity, LED Televisions, air conditioners, attached Western Bathrooms, comfy beds, wardrobes and hot water geysers in bathrooms. This eco resort has a small park where you would find some swings and slips for children and a pond teeming with fish where you can try fishing. Then, there’s a dining hall to enjoy the sumptuous meals and some gazebos and maachans for you to gossip in the outdoors. Services like pick-up and drop to Tatanagar Railway Station and car arrangements for local sightseeing are also taken care by the resort. The food served is essentially Indian cuisine and the locally sourced vegetables and fish make up for the pure flavour and taste.